If you are looking for the perfect wedding dress or other items by Dolloris in New York, you have come to the right place. Here at Crystal Bridal Boutique we have a beautiful selection of options from this incredible designer. You can come into our shop any time to look at our excellent selection, or we can even special order you a dress if you don’t see what you like. In addition, we have a variety of great accessories from Dolloris such as veils and more. We can be your one stop shop for all the dress items you need for your entire wedding. Our friendly and experienced sales staff is here to help you find the right style for you, and assist you with fitting as well. Whether you’re just starting to plan your wedding, or it is sneaking up on you fast, we can help you every step of the way. 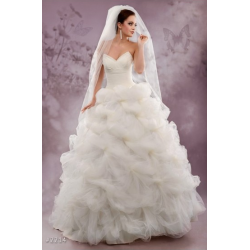 In our shop we carry almost every type of dress that you could need for your wedding. This includes bridal gowns, of course, but that is just the beginning. We also have dresses for the flower girl, the mother of the bride, the bride’s maids and many others. Whatever you need, we’ve got it here for you. Something else to keep in mind is that we offer professional alterations. So, if you have a Dolloris dress that you are borrowing from a friend, for example, we can make the necessary alterations to ensure it fits perfectly. Even if you bought the dress a few months back and now with the wedding fast approaching you find it isn’t fitting quite right, we can fix it up for you to ensure everything about your big day is perfect. This applies to the wedding gown itself as well as any other dresses that may need work. As mentioned above, we also carry a variety of great accessories to go with your dresses. Veils, tiaras, jewelry and even garter belts are all available and in stock at our convenient Brooklyn location. If you don’t see something you need, just let us know. Our dedicated sales staff will always work hard to ensure everything is absolutely perfect for your big day. No matter how far away or how close your wedding day is, make sure you contact us as soon as possible. The more time you have, the easier it will be to find the perfect dress by Dolloris and ensure that there aren’t any possible problems. You can come in on your own, or even bring your family or friends to help you through the process. This can be a great bonding event to help build excitement for your wedding. However you decide to do it, please don’t hesitate to give us a call at 347-462-4941. You can also stop in our shop anytime. We are located at 1110 Ave U Brooklyn, NY 11223. We’ll be more than happy to answer your questions or help you to try on your favorite Dolloris dresses anytime that is convenient for you.